Recently I was having a look around the Mezz in Mt Hawthorn and I noticed a restaurant that looked really quite interesting and had a really nice buzz about it. 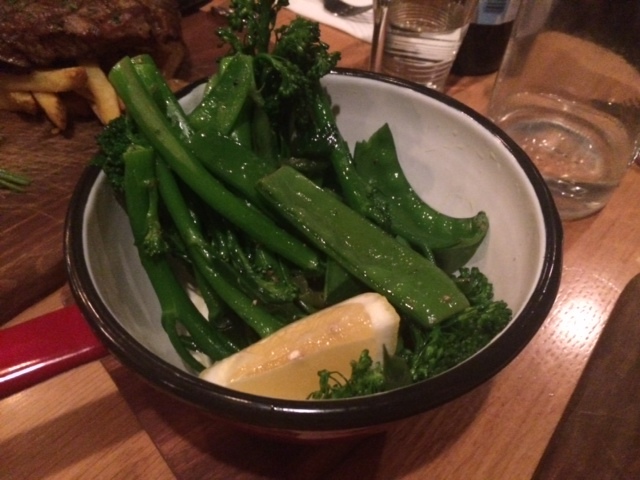 As I was looking for a restaurant to head out to with friends on Saturday night I had a look at the menu and decided that it looked like it would be a nice, relaxed, fun spot to have dinner at and I was right! The head chef, Carlos Tavera, hails from Jamie’s kitchen originally and he works with his team on a great menu that sources the very best seasonal produce from local West Australian suppliers. It is evident that Carlos comes from the Jamie’s Kitchen background as all of the meals are served on wooden planks, which adds to the rustic, homely feel to the place. Being a Saturday night they had live music which added to the ambience and from the minute we walked in the staff were friendly, attentive (without being too attentive) and just added another positive to our dining experience. The menu is not overly long or complicated but there are plenty of choices for starters, main courses and also for desert if you can still fit any food in after the first two courses! We all opted for different starters and none of us were disappointed with what we were served. 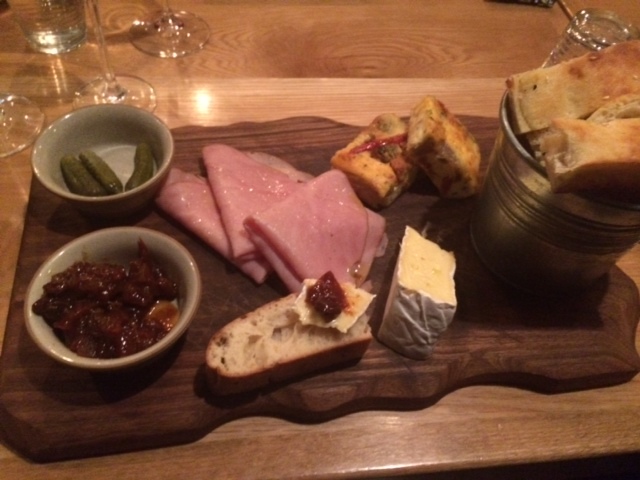 I decided on the ploughman’s plank which was made up of french double cream brie, thickly sliced leg ham, house made tomato & apple chutney, vegetable frittata, cornichons and a bucket of warm Turkish bread. 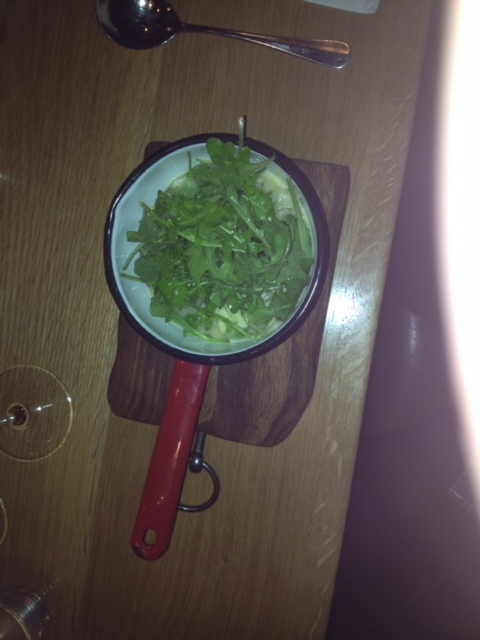 This was a perfect winter starter to my evening and I enjoyed every aspect of the dish. The brie was sensational and the home made tomato and apple chutney was a real highlight. Trevor opted for the asparagus & pea risotto with freshly shaved pecorino and wild rocket and was blown away by the complexity of flavours and the delightful mixture of the asparagus and pea combination. 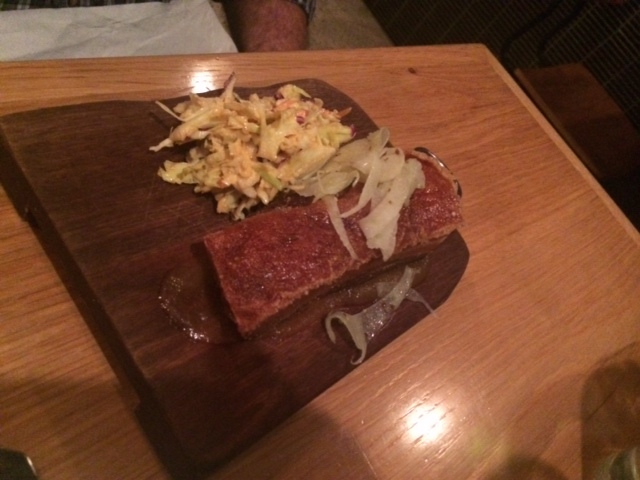 Ken opted for the pork belly strip that was slow roasted crispy belly served with sweet apple puree & Spanish style coleslaw. It was a generous size and he loved the tastes and the added combination of the sweet apple puree. It all worked together to create a memorable starter. 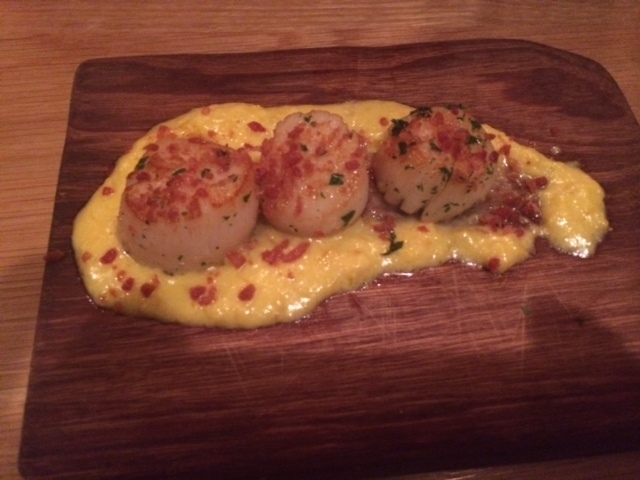 Karen decided to start her meal with the seared scallops in the half shell with a corn puree and bacon crumb. This was delicious and she enjoyed it but it was not served in the half shell and I think that getting only three scallops was a little rich. Even though they were a decent size I would have thought at least 4 would have been a better serving size for the price. Once the entrée was over we enjoyed the music, caught up and waited for the main courses to be served. 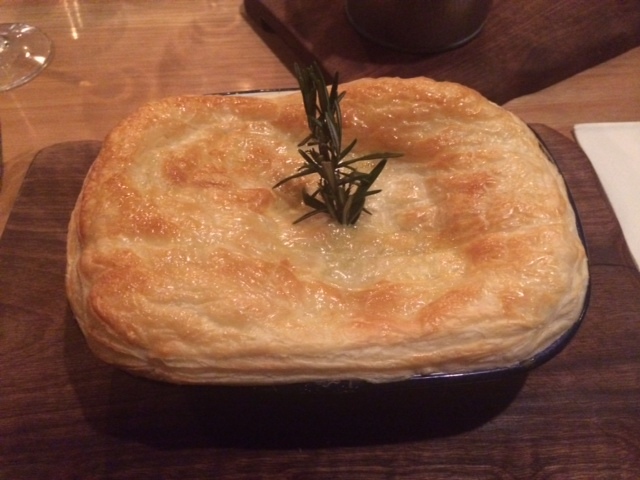 Trevor and I opted for the peasants pie which consisted of slow braised graziers beef & wild mushrooms in a Chianti and tarragon sauce, with a light puff lid. I loved this and the flavours were sensational, it was hot, tasty and really filling, however in the kitchen they must have run out of filling or something as the pie that Trevor received seemed to be filled with about half the filling that I got and even though he loved the flavours and tastes, he was disappointed with the amount of filling and that spoilt this a bit for him. Karen chose the seafood special which consisted of prawns, scallops and squid combined and served with linguini in a light sauce and served as a parcel served with fresh lemon and warmed Turkish bread. 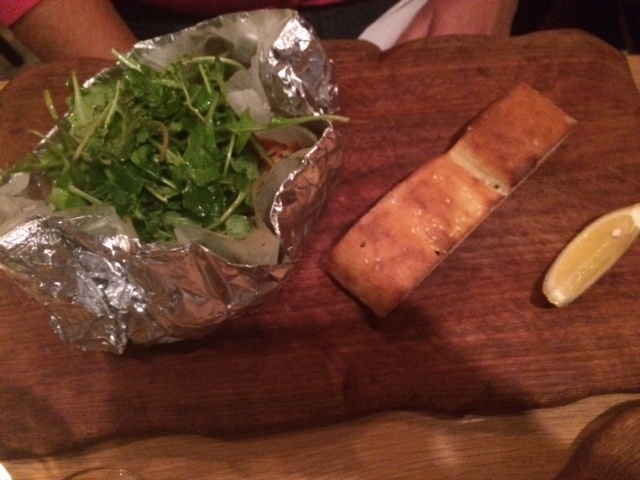 Karen really enjoyed the flavours of this dish but again was disappointed in the amount of seafood included. Whilst the flavours worked really well 3 prawns, a couple of scallops and a little squid did not really make for a satisfying main course. 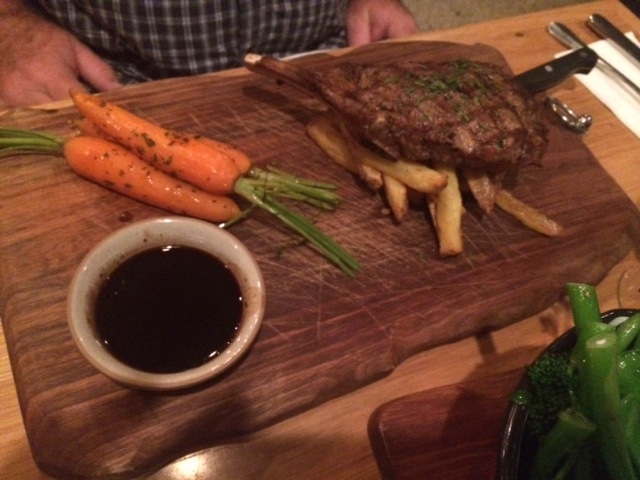 Ken decided on the rib eye, served with hand cut chips, baby carrots and served with a rich jus on the side and he was really pleased with the way it was cooked and the jus complimented the rib eye perfectly. 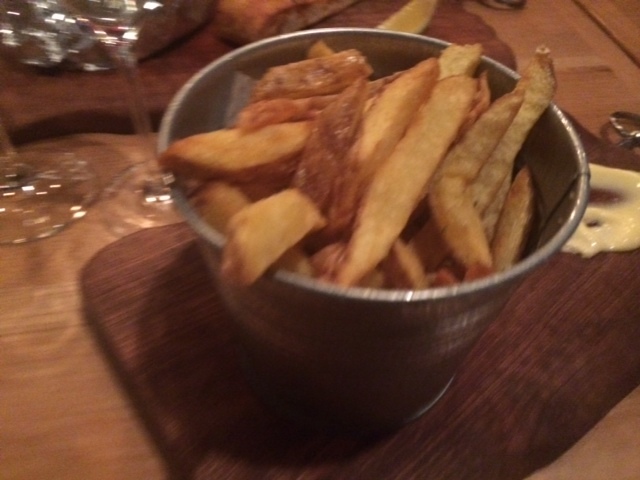 We opted for the seasonal vegetables and hand cut chips as our 2 sides and both were well cooked, tasty and delicious. The seasonal vegetables were rich, creamy, tasty and very fresh, but again the issue was at $17 the amount of vegetables included was a little bit disappointing for 4 people to share. I would have thought for that sort of price that we would have received at least twice as much. That is also a lot to pay for a side dish. I would have thought $10 maximum. Over all the night was a good one and we would all certainly head back to the Peasant’s Table again and I think if they look at their portion sizes a little closer then this wold be a great spot for a casual dinner with friends in a spot with great atmosphere and wonderful service! The Butterworth – a dining delight! Sushi WAWA – the longest, freshest and best in WA!